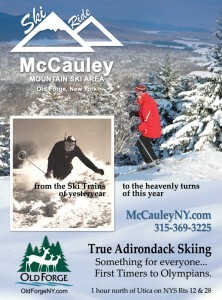 Over the next week, McCauley Mountain will be spotlighted under the neon lights in Times Square in New York City thanks to Old Forge Publicity Director Mike Farmer. From December 27 to January 2, a series of five-second commercials for McCauley will be broadcast from two locations in Times Square. According to Farmer, the ad will run 120 times on the big digital screen outside the ABC studios and 120 times on the Disney digital screen throughout the week-long period, which includes New Year’s Eve and New Year’s Day. This entry was posted in admin and tagged carol hansen, McCauley Mountain, Times Square on December 22, 2011 by Carol Hansen. Over the past several weeks the Town of Webb Board of Education has been conducting a search to replace Superintendent Gooley who will be retiring on January 31, 2012. The board started with fifteen applicants, said Board President Julie Zaykoski, and after conducting a series of preliminary interviews with the applicants, they have narrowed it down to three candidates. The candidates will be interviewed on Wednesday, January 4 by select students, instructional staff, non-instructional staff, and any community members interested in taking part. This entry was posted in admin and tagged Dana Armington, school, Town of Webb on December 22, 2011 by Dana Armington. The Hamilton County Federation of Sportsmen Inc. are sponsoring a Coyote Contest in Hamilton County through March of 2012. Each month, $150 will be awarded to the person who weighs in the largest coyote. 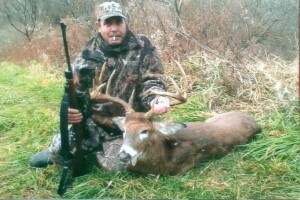 This entry was posted in admin and tagged coyote, Hamilton County on December 22, 2011 by admin. The Town of Webb Union Free School District and the Herkimer County Prevention Council will present a drug and alcohol awareness night for area parents at View’s Gould Hall on Wednesday, January 11 at 7 p.m.
During the program, New York State Trooper Dave Olney, who has extensive training in drug and alcohol recognitions, will identify signs of adolescent drug and alcohol use. This entry was posted in admin on December 22, 2011 by admin. 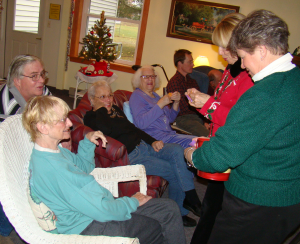 The Old Forge Garden Club sponsored a Holiday Party for the residents of Lakeside Terrace in Old Forge on Tuesday, December 6. Above: Loretta Kaye and Carolyn Trimbach draw the names of winners at the Old Forge Garden Club's party at Lakeside Terrace. 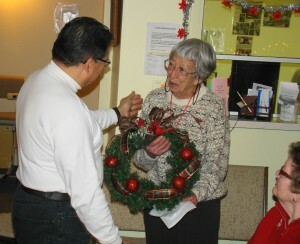 Below: Brenda Carmer takes her prize wreath from Jimmy Ortiz. Courtesy Photos. The Garden Club members in attendance brought platefuls of homemade cookies and poinsettia plants for each of the 23 Lakeside residents. Special guest Jimmy Ortiz, owner of Feathers & Boughs Inc., demonstrated how to revive old Christmas wreaths and how to make new wreaths and other holiday decorations. The seven finished decorations were raffled at the end of the presentation. Winners were Betty Rose Byszewski, Peg Morgan, Phoebe Greene, Dorothy Walker, Jimmy Ortiz, Marilyn Gaebler, and Brenda Carmer. This entry was posted in admin and tagged christmas, garden club on December 22, 2011 by admin. Jim and Judy Herron have announced that their daughter, Jackie Herron Darmody, has officiallly taken over Herron Realty as broker/owner of the busy real estate business on Main Street in Old Forge. Darmody, a graduate of the Town of Webb School, has worked in the business since 1988, so the field of real estate has been a big part of her adult life. Jim and Judy Herron have been in the real estate business since 1962, when they operated two real estate offices in Hunterdon County, New Jersey. This entry was posted in admin and tagged carol hansen, Columnists, Herron on December 22, 2011 by Carol Hansen.